You are what you eat and you are what you drive, so what happens when what you drive is what you eat? 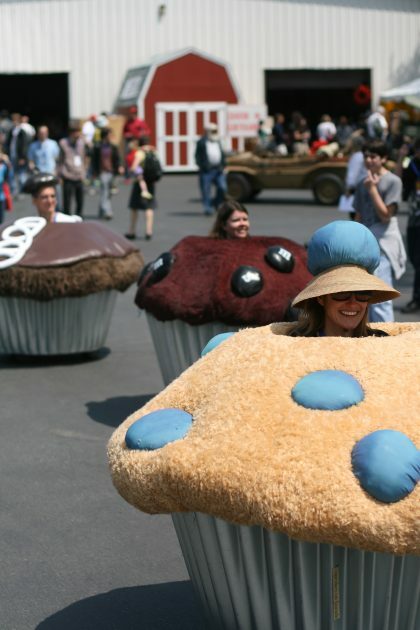 Motorized muffins and cupcake cars have been popping up at events such as parades and Maker Faires since their debut at Burning Man in 2004. The original muffineers, Lisa Pongrace and Greg Solberg, came up with these electric edibles as a new project for that event, combining Pongrace’s art talents and Solberg’s electrical engineering skills into one deliciously-appealing masterpiece. Their original pastry menu consisted of a blueberry bran muffin and a chocolate cupcake, and has since grown to include two baker’s dozen worth of blueberry, cranberry, English muffin, pink sprinkles, and many more flavors. With the driver’s head sticking out on top, most of the muffin cars run on deep cycle marine batteries, so pedaling is typically not involved. These potentially dangerous delectables have a top speed of around 17 miles an hour, which is pretty fast for a cupcake, and they tip over easily while the brakes aren’t the best. However, the cars are insulated so it doesn’t feel like you’re being baked when you’re inside the cupcake car. After the muffineers showed up at Burning Man in 2004, the Department of Motor Vehicles came up with a new policy for these “mutant vehicles,” requiring all art vehicles to be pre-registered and approved before driving around these events. 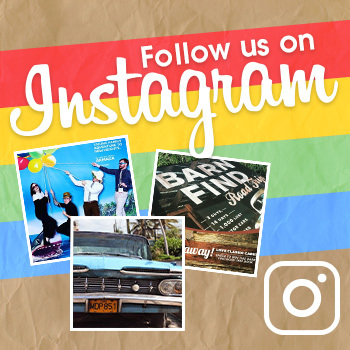 As a global cultural movement in a desert, Burning Man is a community rooted in the 10 Principles, focused on art and the art of giving. What is more artistic and giving than seeing a cute muffin car speed by and receiving a smile across your face, along with a sudden craving deep in your stomach? Because they didn’t want just anybody to buy one, these customizable muffin cars were priced at $25,000 in 2009. Only the makers can drive these cars to help avoid a crummy crash, but if your stomach and heart so desires, you can make your own portable pastry for as little as $500, though they can cost more than $1,500 if you really decorate and frost your cupcake for a sweet ride. The ingredients include steel, wood, chicken wire, fabric, and an electric motor, with the bake time depending on how long you invest in this electrifying art project. If you want to make your own mobile muffin, you can sign up for Acme Muffineering’s mailing list and receive advice on building your own feast on wheels. And for those who are wondering — the difference is in the batter. Angela Lin is a Dayton native who is currently a student at the University of Michigan (Go Blue!) majoring in English and the Environment. She is a copy editor for The Michigan Daily, an arts reviewer for [art]seen, and an indie music blogger for downinthepit. When she isn’t reading and writing for fun or for school or for work, she enjoys listening to any and all music, going to see musicals, playing the piano, spontaneous adventures followed by peace and quiet, and talking about wombats. Seriously, ask her about wombats.